I have called for a 10% to 15% correction since July 30th. 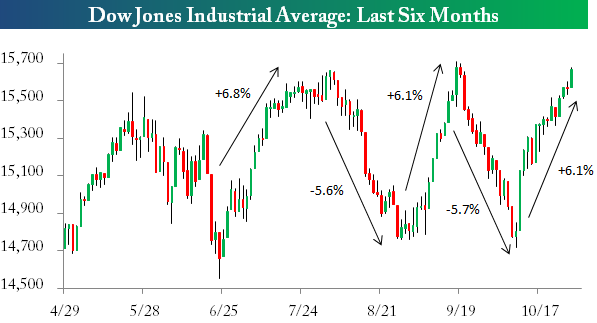 Instead, all we’ve seen are back to back 5% corrections. Maybe I can just add them together and claim omniscience. This market just keeps climbing and climbing. BTATFH? It would seem that is the obvious trade du jour, but I just can’t bring myself to not bet against the momentum. My gut tells me to go short. And hell, since I’ve followed tea leaves and chicken bones before why not follow my gut, too. Speculating on your gut is not exactly a profitable path so we’ll get back to a couple of pieces of evidence in support of a short on the S&P 500, in a moment. This chart was then shared by Jon Markman and Louis Basenese in separate articles days later. Essentially, they stated the markets have plenty of room to potentially run and can run higher than you may think. That’s reasonable on the surface and I agree that this market has plenty of room to run in light of the oceans of liquidity flooding across the earth. But a 10% to 15% potential correction within a bull just won’t stop nagging at me. For good measure, Bespoke also posted this chart which leads speculators to believe a trend change may be upon us. Doesn’t that last candle look a touch toppy? And then there’s the kings of anecdotal, the newsletter writers. The Investor’s Intelligence survey, as a contrarian signal, is leading us to believe that a corrective move may be in the cards for the markets. 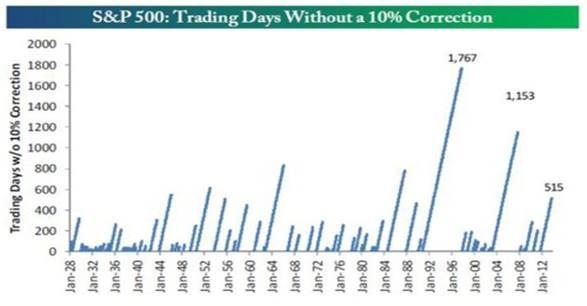 Observe the following chart, courtesy of SentimentTrader.com. 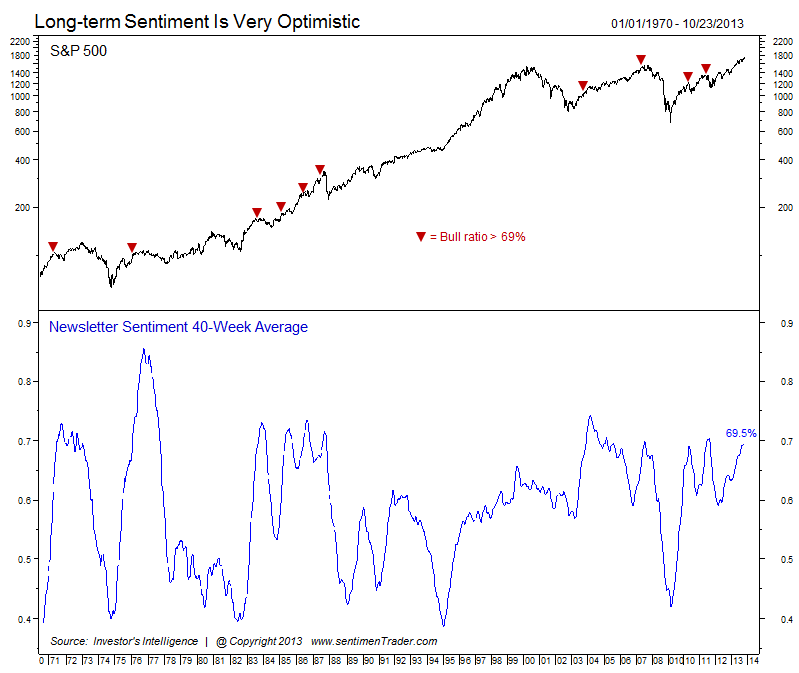 It shows that a Bull Ratio of 69% or higher is the Mendoza line for this indicator and the last 3 times this number was breached, a correction followed shortly thereafter; including the big one of 2008. As I’ve stated in numerous previous posts, I don’t think a giant crash is in order. Just a let off of some steam and the shitting of some trader’s pants. Well charts are all well and nice, but I also like to review what some of the top value oriented managers in the game are doing with their cash. Are they building cash levels or allocating to new positions? Cash level buildup by the trusted brains in the value space of asset management is another solid indicator that something may be up. Bloomberg recently ran an article covering that exact notion. Below are some key excerpts from the article sharing the actions and thoughts of money managers such as Yacktman, Weitz, and De Vaulx. – Weitz, whose cash allocation is close to the highest it’s been in his three-decade career, joins peers Donald Yacktman and Charles de Vaulx in calling bargains elusive with stocks near record highs. They’re willing to sacrifice top performance for the safety of cash as stocks rally for a fourth year in five. – “We will need prices to be down 15 to 20 percent for us to put most of our cash to work,” De Vaulx, co-manager of the $9.2 billion IVA Worldwide Fund (IVWAX), said in a telephone interview from New York, where International Value Advisers LLC is based. The fund, which outperformed 54 percent of competitors in the past five years, had 31 percent of assets in cash and equivalents as of Sept. 30, according to its website. -Yacktman, 72, president of Austin, Texas-based Yacktman Asset Management Co…whose cash level rose to 21 percent as of Sept. 30 from 1.4 percent at the end of 2008, bested 92 percent of competitors in the past five years. “We are having a more difficult time finding bargains,” Yacktman said in an e-mail. MarginRich here – Seth Klarman of Baupost has raised his cash levels to over 30% when he normally keeps the fund’s level at around 20%. Additionally, he’s planning on returning several billion dollars back to investors at the end of the year, as bargains are scarce. In a normal year, and clearly this is not a normal year, we would expect to add four or five new companies to the portfolio. Hence, our antenna remains acutely tuned to capture any signal that alerts us to highly attractive investment opportunities, but our equipment is mostly picking up the noise of bull hoofs rampaging wildly as Ben Bernanke pours endless liquidity into the capital market. Speaking of Mr. Bernanke and the Federal Reserve, we would immensely appreciate it if he and his cohorts would explain to the American people what would happen if the Fed stopped buying $85 billion worth of Treasury and mortgage securities every month. Does the Fed believe the U.S. economy would collapse sending all of us into the poorhouse? Do they think the stock market would nosedive and wipeout trillions of dollars of wealth? Do they think interest rates will rise substantially and by enough to snuff out the recovering residential real estate market? If the answer is yes to any or all of the above, then our economic foundation is shakier than many might believe…We continued to take advantage of strong upward momentum in the market place and trimmed a number of positions. When the market is trading at rich multiples, we trim or sell our positions. Currently, the market is expensive so we have more cash than usual. We are absolute value managers so we will stay on the sidelines as long as it takes and husband our cash until excellent investment opportunities become available. On the other hand, we will quickly deploy capital into investments if they are attractive – like we have done on three separate occasions this year. You get the point. There’s a significant amount of compelling anecdotal evidence, but let’s get back to the charts. I was reading an article last week from Stansberry Research, by their in-house trading expert, Jeff Clark. 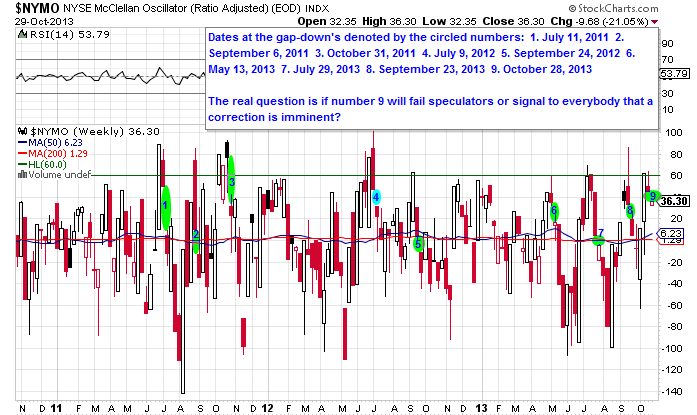 In the piece, Clark extolled the virtues of the NYSE McClellan Oscillator (NYMO) as a timing indicator for this year. 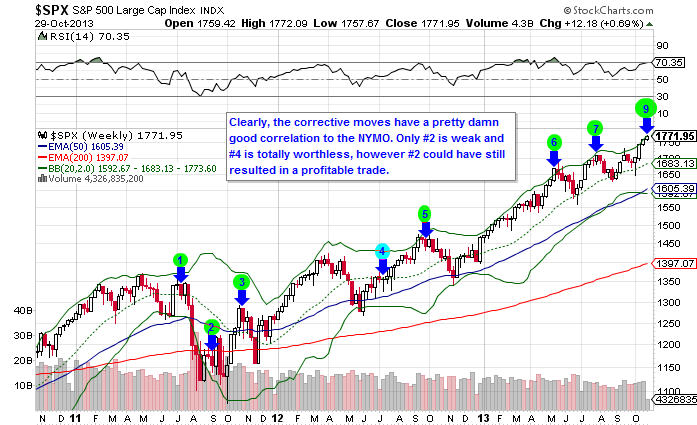 I decided to go back a couple more years and gauge the NYMO’s timing ability to the S&P 500. The correlation is quite robust. Observe the following charts of the NYMO and the S&P 500 going back to 2011. Since November of 2010, almost every time the NYMO hits 60, as denoted by the green line, then the subsequent gap down marked the beginning of a correction. It did not work on July 9th, 2012 and it wasn’t worth using on September 6th, 2011. Still, this indicator could have been traded profitably on the short side in 8 of the last 9 occurrences…and this week marks the 9th occurrence. Are you ready to go short? I know, I know. Don’t fight the Fed. Don’t fight the trend. Don’t fight the market. I know all these things, and yet like a moth attracted to a light, I just can’t resist the potential of front running a corrective move. I know that waiting for a trend change is the prudent move, but the volatility has consistently swung so quickly this year and whipsawed so violently in some cases, that a hedged trade with a disciplined stop just may be the right move. One of our readers pointed out to us last week that the recent strong rise in the so-called CBOE SKEW index should also be counted among the various divergences that make the stock market’s current advance suspect. Skew measures the perceived tail risk of the market via the pricing of out-of-the-money options. Generally, a rise in skew indicates that ‘crash protection’ is in demand among institutional investors (institutional/professional investors are the biggest traders in SPX options). The basic idea is similar to the CSFB ‘fear index’ or the Ansbacher index (which compares the premiums paid on equidistant calls and puts). A unusual move in the skew index (which historically oscillates approximately between a value of 100 and 150) is especially interesting when it diverges strongly from the VIX, which measures at the money and close to the money front month SPX option premiums. Basically what a ‘low VIX/high skew’ combination is saying is: ‘the market overall is complacent, but big investors perceive far more tail risk than usually’ (it is exactly the other way around when the VIX is high and SKEW is low). In other words, a surprising increase in realized volatility may not be too far away. Below is a chart showing the current SKEW/VIX combination. MarginRich here again – It should also be noted that 135 is the sort of magic number for the SKEW. Generally once that level is breached, then the potential for some action really heats up. So if you agree with what you have read here today, then the only question is how to structure a trade. There’s the old straight short of the SPY. You could sell some Calls and fund a Puts purchase. Or who says you have to specifically trade the information? Maybe you decide to take some risk off of the table. Above all else, I recognize that the analysis could just as easily be nullified instead of confirmed, which would simply make this article entertaining(or annoying) and me wrong once again. If the index continues to set more all-time highs and breakout to another stratosphere, then the analysis is negated. None the less, with full disclosure, I intend to structure a trade off of this data. What trade are you structuring off of this data? If the market is trending all-time highs are you are going to short precious metals, tech, which area? Inquiring minds want to know what area of the market you are going to make your move in. I’m simply going to short the whole index using the SPY, with a version of the options trade I listed in the article.